Salted caramel is a food trend I fully support. I was always a fan of caramel and making this sweet/salty combination is pure culinary genius! It’s grown in popularity over the years and now almost everywhere you go to eat or drink has something salted caramel on the menu. I can’t resist especially this Salted Caramel Fudge. 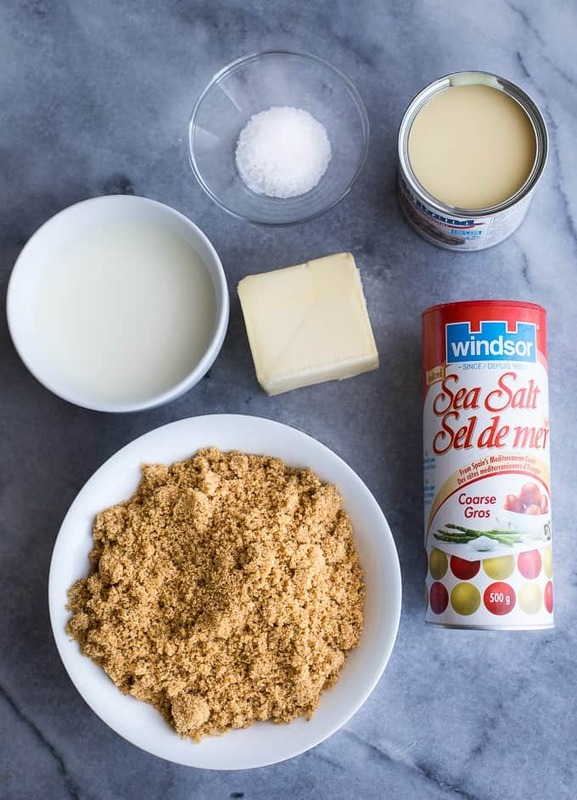 Windsor Salt is one of Canada’s iconic brands and is perfect for all your salted caramel baking needs. 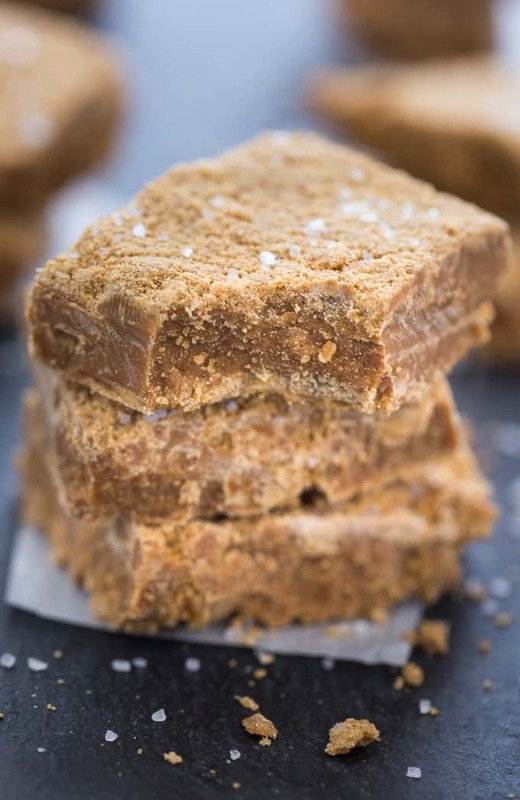 They have a scrumptious recipe for Salted Caramel Fudge that you simply must try. I made it earlier this week and oh my wow. It’s sooooo good! It practically melts in your mouth. When you are out grocery shopping, you may notice that some varieties of Windsor Salt have a new look. They’ve recently updated their logo and product packaging. The packaging still has the familiar dots and blue castle logo, but a fresher, more modern feel to it. Here’s a quick peek at the new look. 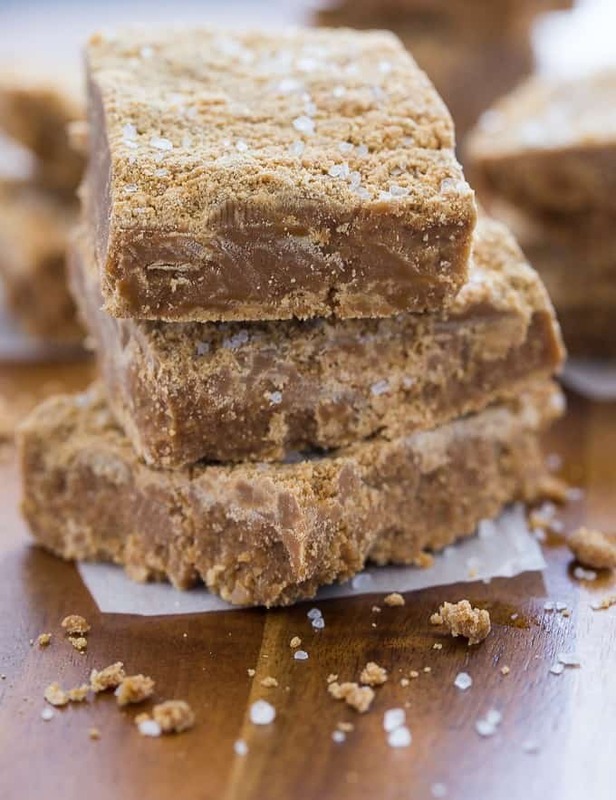 For this Salted Caramel Fudge recipe, you’ll need Windsor Coarse Sea Salt (I found mine at Food Basics), condensed milk, milk, unsalted butter and brown sugar. I haven’t made fudge this way in ages! Why? I don’t know. 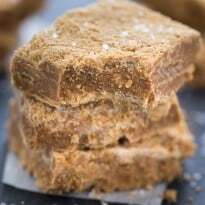 I love fudge and this recipe reminds me of the fudge my Gramma B used to make. Fudge isn’t the kind of recipe you can set and forget. It requires constant attention. I recommend making it when you have at least 20 minutes of uninterrupted time. I made this recipe when the kids were in school so it had my undivided attention. The reason being is the constant stirring it requires. If you stop, it will burn. I ruined a pan many moons ago making chocolate fudge so I know all too well how important it is to keep the fudge moving! I also used a candy thermometer to make the recipe though the instructions don’t require it. I prefer to know when I’m at the exact temperature instead of having to test what stage it’s at. Mine took the full 20 minutes to reach the proper temperature. Some of the sea salt is mixed in after you remove it from the heat. Then you need to stir it more off the burner to reach the desired consistency. You add the remainder of the sea salt after you’ve spread the fudge mixture into your pan. Slightly press it in with your clean fingers. After two hours in the fridge, it’s ready to serve. Cut it up into small bite sized squares. It’s rich with beautiful flavour. The sea salt complements the sweet, creamy caramel perfectly. It’s one of those desserts where you just have to say, “mmmmm”. Now that you have your shaker of Windsor Coarse Sea Salt, use it in your other recipes. It works fabulous to season meat, fish or seafood and you can already see how well it works in desserts. Salted Chocolate is also good! This Nutty Choco Crunch is another must-try dessert. Make sure you browse through the selection of yummy recipes on Windsor Salt and buy their other varieties of salt. I made these Egg Dress-Ups with Windsor Kosher Salt. Yum! Are you a fan of the sweet/salty combination? 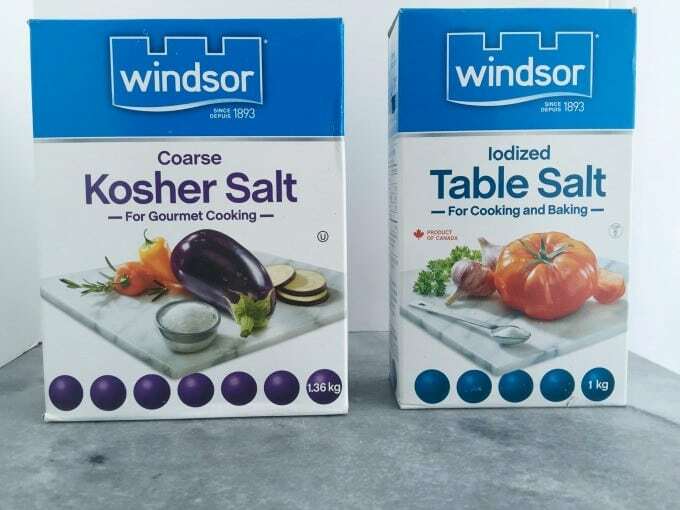 Connect with Windsor Salt on Facebook and Twitter. The perfect combination of sweet and salty. This decadent dessert will literally melt in your mouth! Line a 9×9 baking pan with parchment paper and grease well. Combine all ingredients, except the salt, in a heavy-based saucepan and stir over medium heat until mixture is bubbling comfortably. Note: make sure you keep the fudge moving at all times especially around the edges so the sugar won’t burn. Stir until the fudge has turned a golden brown colour, around 15 to 20 minutes. Test the fudge by picking up a small teaspoon of the fudge and drop it in a small amount of cold water. If the fudge forms a firm ball, then it’s cooked enough. If you are using a candy thermometer, this is at the 118 to 120C stage. Remove fudge from the heat and add 1/2 tsp salt. Beat with a wooden spoon for about 10 minutes or until the fudge is thick and lightly grainy. Pour the fudge into your prepared baking pan and smooth into the corners. Sprinkle on the remaining slat and press in gently with your fingers. Cool the fudge in the fridge for at least two hours before cutting into bite sized pieces. 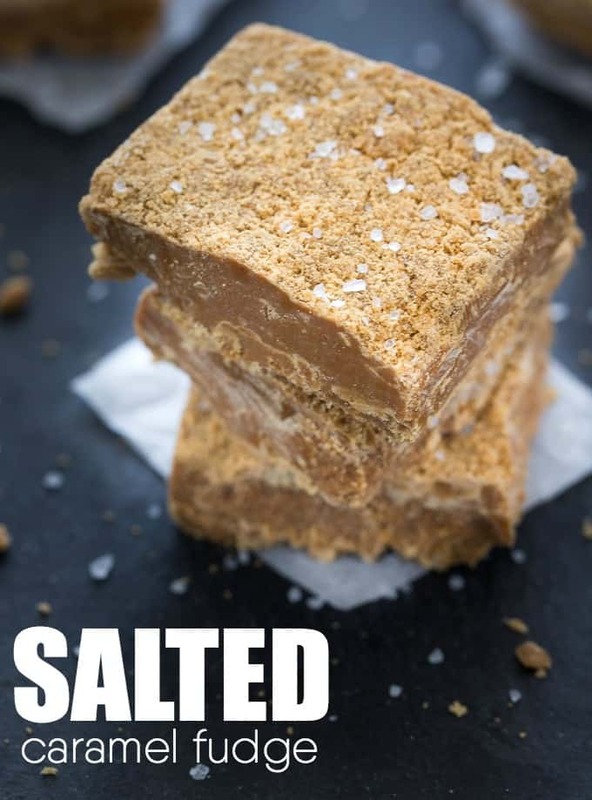 Caramel and fudge and salt? I’d love it. Wow! Looks delicious!! Going to try making this! This week! Thanks!! This looks so delicious–now my mouth is watering! Oh my! That looks delicious and so easy! We have a road trip coming up and this will be the perfect travel snack! Thanks for the recipe! I agree..salted caramel is a fad that I don’t object to in the least…Your trend-following recipe looks absolutely wonderful. Pinned this one, for sure, and looking forward to making it soon! I’m not especially a fan of the salted caramel myself but I have a few family members who love it so this would be a great handmade gift idea, thanks. This looks amazing! I’m on whole30 right now so can’t have it, but I’ll have to try it when I’m done. This looks amazing! I love salted caramel so much. I bet it tastes amazing in fudge form. Definitely pinning this. I’ve never tried salted fudge before. I imagine it’s delicious! This looks so yummmmmm. Will have to try it out! Thanks for sharing and have a great day! Such a decadent treat Stacie. Caramel is so yummy and adding the salted makes it over the top. Thanks for sharing this decadent treat at DI&DI. Oh my word, I’m drooling here. Yes, I fully support the salted caramel trend. Love love love it! Thanksfor sharing with Small Victories Sunday Linkup. Pinned to our linkup board.